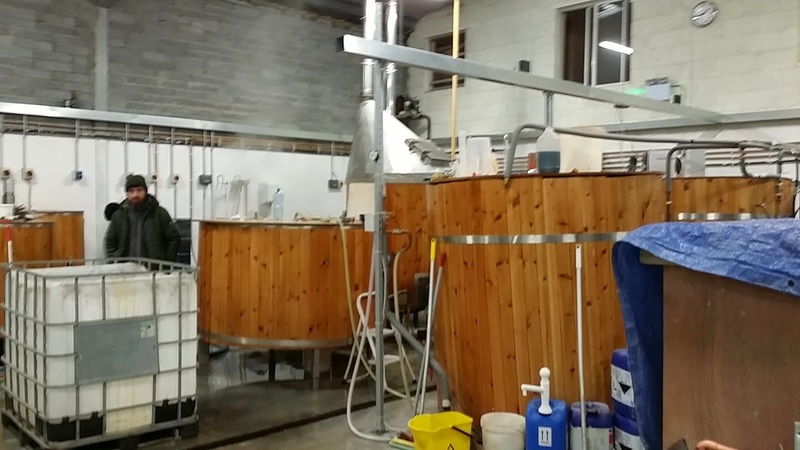 While I was in Galway recently I took the opportunity to hook up with Tom Delaney, home brewer turned pro brewer, and full time employee with Galway Bay Brewery. Tom is like myself with an interest in sour beers, but is lucky enough to have an employer that allows him limited scope to experiment with sour beers, the first of which was a "dark sour", or a sort of black Berliner Weisse style beer titled "Heathen", released shortly before Christmas 2014. Crossed wires and an unwillingness to travel too far from the bus or train lines have so far conspired to prevent me from sampling Heathen, but the reports from t'internet so far seem to indicate that even at a diminutive 3% it is a very good beer indeed. To date it is only the second intentionally sour beer brewed commercially in Ireland (the first being Scarlet from White Gypsy). 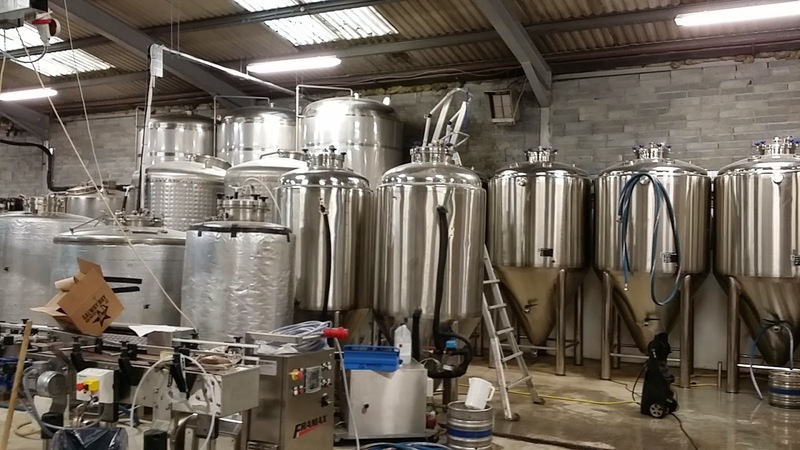 I met Tom at the brewery in Ballybrit Industrial Estate in Galway city where he gave me a tour of the facility and explained his process. Tom makes up a starchy wort of mostly barley malt and torrified wheat, and then spikes it with a couple of scoops of Weyermann acidulated malt. Acid malt has undergone a process at the maltster whereby lactic bacteria that naturally occur on-grain are encouraged to grow and produce lactic acid. The process is halted once the desired levels are reached. This lactic acid then remains on the grain and can be used to all sorts of effect in brewing where lowering pH is required. It's not strictly speaking wild, as it's restarting a process Weyermann had put a stop to, but it produces some fairly good results, and it's reasonably predictable (read: repeatable). Tom relies on taste to determine when the acid levels are to satisfaction rather than measuring pH, sampling every couple of hours. He makes sure the wort is protected from an onset of latent acetobacter by keeping head space filled with nitrogen gas. 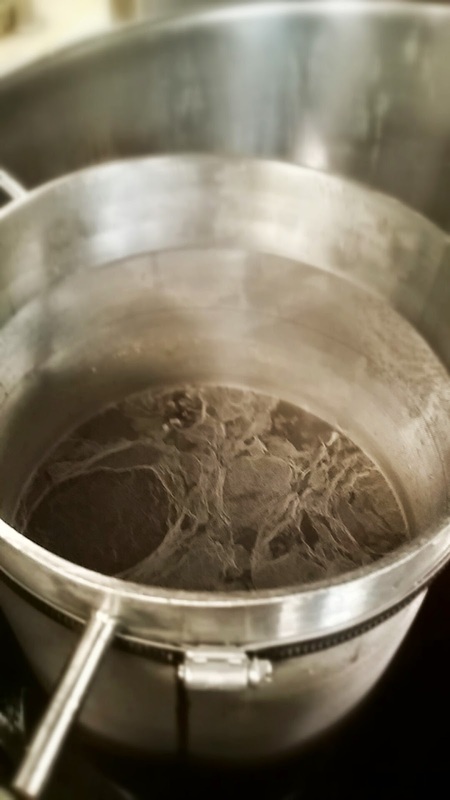 When he's happy with the level of sourness, usually within 20 to 30 hours, the boil will take place to kill everything and halt the progress of the lacto (and anything else). The boil is 15 minutes and the hops are added once the boil starts rolling. Long single infusion mash at 65°C (simpler than a step mash to save time, but if you wanted you could do a step mash at home), wort is transferred to kettle and cooled to 40°C, where it's kept till nice and sour as outlined above. For blackening I cold steeped 25kg Carafa III for 16 hours. I used a very large fine filter hop bag in my mash tun. All this thick black syrup gets added to the boil kettle. That full bag blackened 1300 litres of pale wort. Not sure what that works out at on a 5 gallon level. Gordon Strong would be proud! (Gordon advocates not mashing dark grains) For a 20 litre batch that works out about 400g. This is the kind of beer that doesn't benefit a lot from ageing so it's force carbonated to a fairly high level and served fresh in the brewery's tied bars. During my visit to the brewery it was nice to get a taste of a sour IPA from the fermenter, another one off, this time Chris's concept, soured in a similar way to Heathen, and only missing a name at this point. Full of grapefruit and orange citrus tang, this quite tasty brew should be making its way to Galway Bay bars soon. 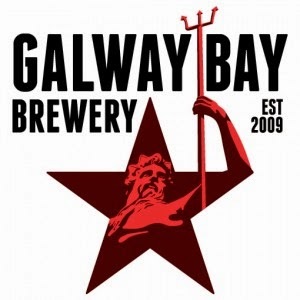 While Galway Bay Brewery is not set up for full sour production, replete with barrels and brett, it is great to see experimentation and a willingness to venture outside the holy trinity that so many other breweries are constrained by. Wishing Tom and the rest continued success! Shiny tanks. The one in the foreground second from right has the sour IPA.